Insta-book. $1B! 13 employees! 700K+ a day “salary”! Systrom! Photos! Yay! FB! OMG. LOUD VOICES! Ok, now that Instagram madness is covered above let’s talk about why FB bought. I’m breaking down my thoughts into 2 categories: 1) Why I think FB bought and 2) how they helped justify the price tag. I should highlight that the thoughts below are mine alone and are simply an exercise in thinking how FB arrived at its 1B conclusion. FB doesn’t have a track record of getting mobile right (it’s got a 2-star app rating). Instagram is getting mobile right. 30M downloads and a perfect 5-star rating prove that. That Instagram has 13 employees is irrelevant. FB likely has 300+ super-talented people focused on mobile. Has it produced Instagram like results? No. If you’re still arguing that FB should have just hired 13 great mobile developers for 0.1% of their acquisition cost, please read the preceding 3 sentences. The results are what matter. FB is a social network. And by definition benefits from network effects. Engaged users are engaged because user generated content continually draws them back in. A massive component of that UGC is photos (FB became largest photo sharing site all the way back in 2009). All of a sudden, a new photo kid is in town & growing quickly. And he understands how people share photos today (via mobile devices). Google has plenty o’ cash & has signaled their intent to muscle into the social space. FB is understandably concerned about the Google threat. While Google may not “understand” social the way Facebook might not “understand” mobile, big daddy G is still a veritable opponent. If you’re FB, that sounds terrifying. Given the strategic reasons above, how might have FB have justified the price? If FB wants to monetize Instagram, they can. In a big way. 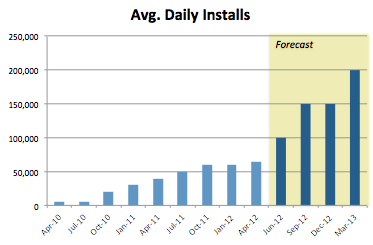 Instagram had roughly 30M installs at time of acquisition. 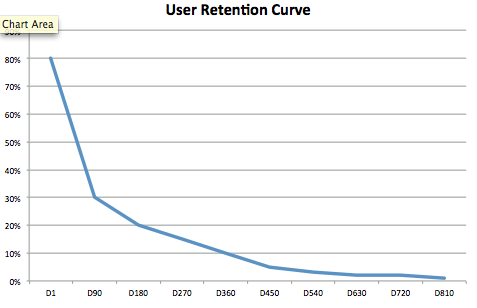 Assume a growth curve like below, with roughly 20% of total installs coming in the last 3 months. We’ll assume they have D1 retention of 80% and D90 retention of 30% (meaning 90 days after install 30% of the users still use app). 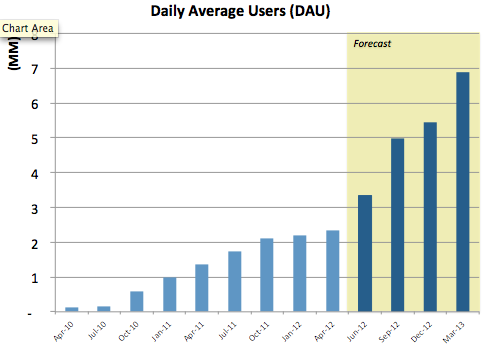 Given their reported installs and our assumed retention patterns, Instagram’s DAU at time of acquisition is around ~2M. 2M is already huge. But potential for further growth is massive. (SIDE NOTE: Post acquisition facts have confirmed significant growth, 10M more in 7 days). And at an an average rev/payer of $3.99 (again below comps of what other top apps can pull in). This implies avg. daily revenue opportunity of ~$220K/day (~$80M annual run rate) in March 2013. Fast forward 3-4 years and Instagram is a serious business. You could argue that Zynga is an unfair comparison because games are different. But consumers have an even longer history of paying for photography (digital cameras today, online space today and albums, films, disposables, polaroids in the past). Regardless of the route, it seems highly plausible Instagram would be able to monetize 0.8% of DAU through some combination of added premium filters, special albums, editing features, extra space or other add ons. What else crossed FB’s mind (the frosting on top)? New data access. Semil Shah has a good explanation of some potential network mapping FB could do. Recruiting top engineering talent in the valley is cutthroat. Instagram is the hip new start-up on the block. FB can sell future talent on the opportunity to work with that team. Nice bonus. “Instragram for video” – I’ll wager good money either Google or FB will scoop up an Instragram for video in the next year. This entry was posted in Uncategorized and tagged Acquistions, Facebook, Instagram on April 16, 2012 by admin. Former Googler & aspiring foodie. Currently lead product for Zynga Mobile Poker (iOS + Android) and enjoy writing on tech products & product development. You can find me on twitter and Google+. Views expressed here are my own (not my employers).